He’d lived without her touch for years. Now he wanted her kiss, her heart, her hand in marriage. Yet she could surrender only a few nights in his arms. After Waterloo, Drayton Worth watched the woman he loved suffer because of his failures. Riddled with guilt he tried to improve Emma Bedlow’s existence, while cursing his never-ending desire for her. Five years later, when he finally has the chance to convince her to share his life, she declares no man will control her ever again. 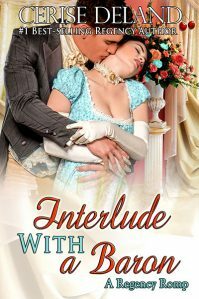 She desires only an interlude with the charming baron. Dray must convince her they deserve more. They deserve forever. “Excuse me, will you?” Dray dismissed himself from the group. He had four days to talk with all these people at this house party. What lured Dray was his favorite puzzle. The famous Marlthorpe maze. He escaped through the French doors opening to the veranda and the complex design of the evergreens. He loved this labyrinth, its path copied from an ancient Greek oracle. For many years, he’d come here to Marlthorpe’s springtime party and sought out the serenity of the garden and the mental exercise it afforded. Puzzles were his favorite pastime when he was not making money. Starting down the entrance, he paused a moment to consider the right turn or the left. He’d tried the left last year and found it led to a circular route back to the entry. Right then, it would be. The yews had grown two inches or more since last spring and the enclosure was quiet, comforting. That is, it was until he heard giggles from another quarter of the shrubbery. The sounds were those of a young child and a woman. “Come now, Christine,” the female voice was low, breathless. It had a distinctive rasp. “You must put on your mask, dearest. You have the advantage if you can see!” The woman laughed though she tried to sound stern. And Dray swallowed, drowning his instincts about the identity of the lady who chased her daughter in the garden. The child shrieked in delight, then pattered away. Rustlings in the bushes gave evidence of the two running. “I found you!” the woman said. “Not fair. Not fair, Miss Bedlow.” The girl objected but laughed nonetheless. Miss Bedlow? How could it be? Dray stared at the wall of greenery. The two chuckled and chased each other. He spun around, following the sounds, his head whirling with the shock and the possibility that Emma Bedlow was a guest at this party. That she played with a child. And that she was in this garden and he was, too. After years of taking care to never cross her path, how ironic that he could come to a house party on a spring afternoon in Berkshire and be so near. He stood, confounded by his choices. Call to her. See her. In truth, over the next three days, he would eventually be near her. To converse. To dine. To dance. Better to face her alone now than later in a room filled with curious spectators. So be it. Following their voices, he tracked her and her charge down one path and left across another. Luck was with him and he recalled one lane with the grey stone bench…and another one with the potted white roses along the east barrier. The girl asked a question and Emma answered, walking toward him and laughing. Anxious, fretful, he turned a corner. Let his eyes revel in the sight of her. She was holding hands with a girl and beginning a children’s roundelay. The girl broke away from her, racing around like a little animal and not watching where she was going, she ran right into Dray. With a grunt, she froze and peered up at him. Dray caught the child with hands to her shoulders. She squirmed and pleaded with him to let her go. But Dray had no presence of mind to do it. He gazed at Em, his soul drinking in her pale green gown, her fuller figure, her wealth of midnight hair. He had died of thirst for years to see her—and he rejoiced that she appeared hale and hearty, even happy, if also at the moment, shocked to stillness. What to say to her? What to call her? He wouldn’t address her by her title. That was one she’d hated, never wanted. And since the autumn, she told it about that she wished to discard her married name for her maiden. He tore his gaze from hers and looked at the girl with a critical eye. The child was too old to be hers and Montroy’s. Was she ten? Eleven? Twelve years old, at the very most. When he’d last seen Em after Waterloo, she’d been married only a year and the anniversary of that great battle would be five years in June. This child was not hers. He took a step nearer. She was as lovely—no, even more beautiful than she’d been as an eighteen-year-old dancing in his arms at the Dunstables’ ball. Now she was what? Twenty-four? Twenty-five? Her cheeks were plumper. Her exotic aqua eyes round with shock. Her form was fuller. A woman, no longer a girl. A woman who had seen too much agony and deserved all the laughter and light she could garner in her lifetime. While the girl murmured how she was pleased to meet him, he took a second to realize Em used the formal title of Naill Wainwright. Astonishing, too, was that this child was Naill’s, the one no one ever saw and often remarked might not exist. “Wait, Em. I must talk to you.” Make amends. The Elgin family had invited her. They had evidently accepted that she needed careful assistance to enter society again. He didn’t understand why she hung back. Unless she was angry at him. And since she had had so little of it in her life, he did as she asked and watched her leave him. As she always did.